The Konica Minolta Bizhub C227 is a multifunction printer able to print from A5 to A3 size which will work well in a small office. It incorporates a scanner, fax machine and copier. The printer has a number of features such as smart print queue and mobile printing which will enhance workplace efficiency. A range of finishing options will give documents a professional appearance, while a number of eco features keeps running costs are to a minimum. The security features protect workplace confidentiality, allowing the printing of confidential documents. However, before purchase decide what optional features are required, as selecting options such as the document feeder will need to be factored into the purchase price. The Konica Minolta Bizhub C227 measures 585 x 660 x 735 mm and comes in a dark design. The printer operations are managed from a ten-button panel on the front. Print speeds are 22ppm, the monthly duty cycle is 19,000 pages and print resolution is 1800 x 600 dpi. Paper is stored in two trays each holding 500 sheets and a manual bypass tray holds 100 sheets. Further paper trays and a large capacity cabinet can be purchased to increase storage. It connects via a USB or Ethernet interface with an optional Wi-Fi connection. 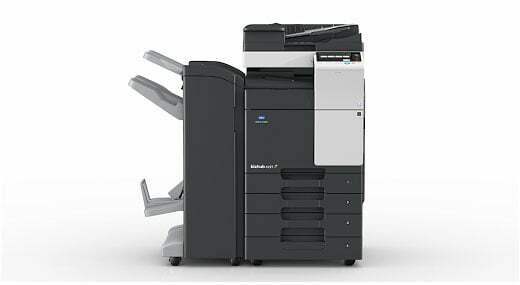 The Konica Minolta Bizhub C227 has state of the art mobile print technology, enabling printing from a variety of devices. Security features include encryption and user access password to allow you to print with confidence. A smart print queue allows printing jobs to be efficiently managed and toner save mode reduces the amount of toner used on draft copies. A range of finishing options presents a professional appearance to documents. Eco features such as low energy consumption and eco scan and copy keeps running costs low. The document feeder is only optional and will increase the price of the Konica Minolta Bizhub C227 if needed.